The Texanist: Hi, I’m From East Texas! Uh, Where Is That, Exactly? A Dallas man who grew up on the Louisiana border isn’t sure his home region actually exists. Q: Although I have lived in Dallas County since 1960, I am really a native East Texan. People often ask me which part of East Texas I’m from. “Kaufman? Tyler? Longview? Rusk?” they’ll say. Sometimes I’m even asked if it’s Paris, Athens, or Palestine. 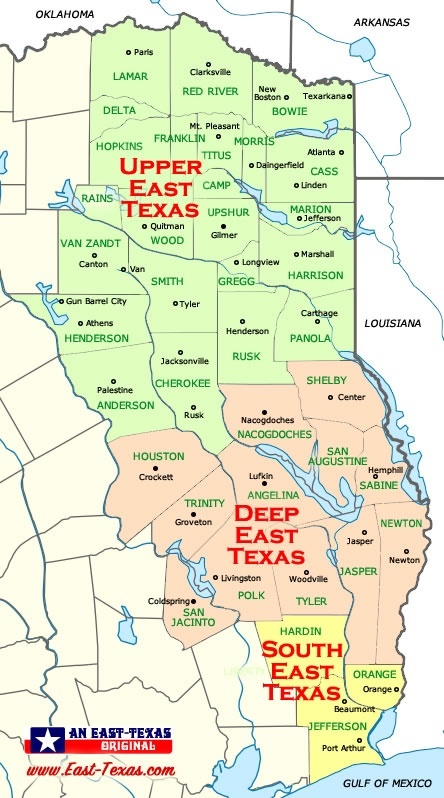 “No,” I tell them, “I’m from Hemphill, in Sabine County, Deep East Texas.” But where is East Texas, really? Is it anywhere from east of Dallas to northeast of Houston? Or could it just be a state of mind, like New York? A: If the Texanist has ever read a sentence pertaining to East Texas that ended with the words “like New York,” he doesn’t remember it. In fact, this may be the first time such a sentence has ever been written. Congratulations, Dr. Sewell. That said, the Texanist has been to both New York and East Texas and can report with as much confidence as he’s ever summoned up while reporting anything in his whole long life that those two places are not at all alike. But the Texanist does see what you’re trying to say with the “state of mind” comparison, even though he’s not really much of a Billy Joel fan. And he doesn’t disagree with you. East Texas and New York are both unique places that exist on a physical as well as a metaphysical sort of plane. But a guide alerting you to where East Texas is not doesn’t really answer the question you’ve posed, which, if the Texanist recalls, was “Where is East Texas?” Additionally, one could reasonably argue that there is no definitive answer to your question. As pretty much any denizen of Big Bend Country, the Gulf Coast, Hill Country, the Panhandle Plains, or the Piney Woods, etc. could tell you, the various lines of demarcation separating Texas’s various regions are pretty fuzzy. That caveat notwithstanding, it is nonetheless fairly well accepted that the greener, damper, and more humid part of the state known as “East Texas” is separated from the other parts of the state by just such a fuzzy line, this one running from the Red River in north central Lamar County (Paris) southwest to east central Limestone County (Groesbeck) and then south and east toward Galveston Bay (Harris and Chambers counties). Anything that lies east of that line and west of our borders with Arkansas and Louisiana can pretty safely be referred to as East Texas, though whether that fuzzy line passes east of, west of, or right smack through the middle of Houston will be argued from now until the end of time. The Texanist hopes this helps you find your place in the world. Have a question for the Texanist? He’s always available here. Be sure to tell him where you’re from. A version of this is published in the June 2018 issue. Sign up for Texas Monthly's State of Texas newsletter to get stories like this delivered to your inbox daily. A few years ago my wife and I were in El Paso talking to a friend that stated that he had lived in El Paso for 45 years, but had originally come from East Texas. Maria asked him where in East Texas. His answer “Brownwood”. So there you go, If you live in El Paso, anything east of Ft. Stockton is East Texas. Alan, that is truly funny. I’m from East Texas. Nacogdoches, the oldest town in Texas. However, Brownwood is not in “throwing distance” of here. Haha. Anything West of 35 can’t be East Texas. I grew up in Groesbeck and have always told everyone it is on the edge of east Texas. Now I have official verification of that. Thanks, Texanist. The Texanist: Help! My In-Laws Call Queso “Cheese Dip”! The Texanist: Can My California-Born Wife Call Herself a Native Texan? The Texanist: Are There Any Decent Dance Halls Left? The Texanist: What Do I Do When a Yankee Calls My Cowboy Boots “Shoes”?